It’s a Great Market for Home Buying and Selling. How About You! It seems not that long ago during that great recession that home prices were declining, the number of foreclosures was increasing and Indiana property taxes were going up and up and up. It was all over the news. As a buyer, and even as a seller, it’s enough to make you simply shut down, afraid to make a move. Well, things have changed dramatically. Indiana’s real estate market has definitely turned the corner. In Indiana, we’ve seen record sales, increasing average prices and declining inventory. Any student of the free market can tell you that increased demand and lower inventory means higher prices. Playing the market and taking the chance at missing the opportunity? If you’re a first-time buyer or if you’ve been waiting to make your move, you should realize that this is the time. Stay…just a little bit longer? The standard feeling is that you should be in your home for five years before selling in order to recoup closing costs and sales commissions. If you’re moving and you expect that five years is how long you’ll stay in your new home, you should do well if you buy now. Average home sale prices are up. Keep in mind, of course, that if your personal situation might change before the five years is up, something that could affect your ability to make payments or the type of home you need (uncertain job status, marital change, children), you should reconsider this home purchase. If you’ve now decided it’s the right time to buy a home in Indianapolis or central Indiana, there are two things to keep in mind. First, talk to your lender and get pre-approved for a mortgage amount. That makes you a more attractive buyer and keeps you from buying more home than you can afford. And two, buy the home that’s right for you, not just the one on which you can get the best deal. It may not be that much more. Keep in mind that interest rates continue to hovering below 4%. How long will they stay that low? If you’re ready to buy, pick the right neighborhood, preferably one that is holding values well. Your REALTOR® can help with that. Work with an experienced Carpenter agent to develop your plan. 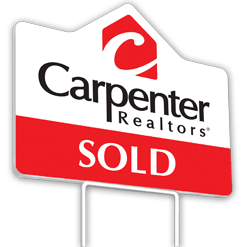 How many homes are currently for sale in the area? Are any unoccupied or in foreclosure? Have prices in that neighborhood held up well? More homes for sale and/or more in foreclosure may add up to a better deal now, but will the neighborhood rebound by the time you sell? 1. You’ve found the right house in the right area for you. Right now, you do have more competition for the right home. If the schools are great, you love the area and know it would be hard to find another house like the one you have your eye on, move quickly. 2. Maybe your rent rivals a mortgage payment. Maybe your current interest rate is high enough that a lower rate means more house for the same monthly cost. If you can buy for the same cost as renting, it’s a no-brainer. Remember the bonus that renting can’t offer: the mortgage-interest deduction on your taxes. 3. You’ve built equity in your house and are moving to a place where homes are cheaper. That could dramatically lower your monthly costs. 1. You don’t have good credit or a decent down payment. In a stronger market the competition for available homes is greater. Sellers will pay more attention to offers from pre-approved buyers with strong credit. 2. You’ve lived in your house less than two years. Realistically, you haven’t accumulated equity in your home. This is true in almost any economic climate. 3. You don’t plan to stay in your next house at least five years. Just like the previous point, you have to be in this long enough to accumulate some value in the home. 4. You’re already in a neighborhood where prices are languishing or where the number of empty homes or foreclosures is higher. To sell a home in those neighborhoods, you really have to be competitively price. Wait out the storm. 5. Your job security is uncertain. If your job, the company you work for or industry’s future is unclear, stay put.